Get ready to paint the town, I mean, your hair red....green, hot pink, or any color you like. All temporary- to wash out at your next shampooing! Fun and creative, without the commitment! I'm gonna show you how to do HAIR CHALKING. 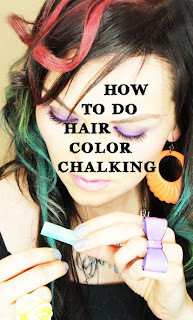 This is not new, it's been around for a while, but I thought I'd do a "hair chalking" tutorial for you guys to inspire you and have fun with! So watch the tutorial below! I wouldn't normally put the red with the green and turquoise, but I wanted to see how the red would show up in my dark hair! As you can see, it showed up and was there to partay-in-my-hair! 1. Soft Pastel Chalks -I got mine at Michael's craft for under $5. ***DO NOT use Oil Pastels- they will stain your hair and everything else! *The chalk might come off on your shirt- you can try misting the hair with hair spray to seal it in even more. *Do not brush your hair too much after you chalk, it will come off on your brush and get everywhere. 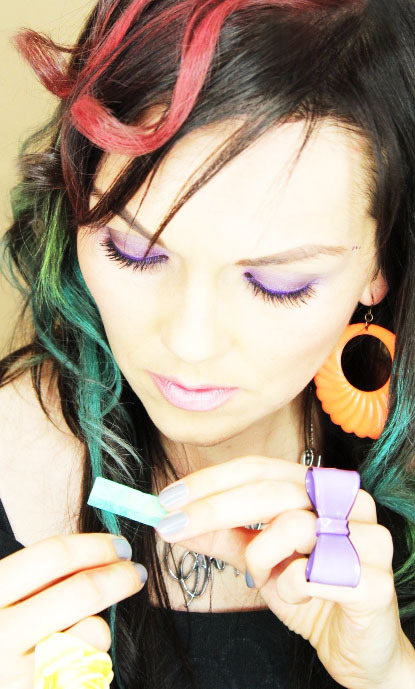 *Do NOT put any wax, styling creams or anything on the "chalked hair" as it will make a huge, greasy mess! 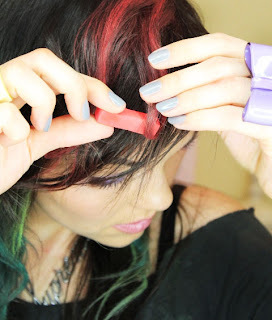 *If any chalk comes off on your flat iron or curling iron, it wipes off easily. *If you have blonde hair, you can skip the step of getting your hair wet- if you do, it may make the color last longer than you'd like! *Have fun trying all kinds of colors, 2 or 3 starting with the light then going over it with darker colors. 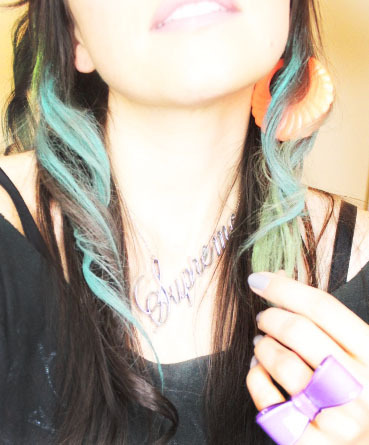 *Blues, greens, reds and pink really show up on dark hair. *If your hair is light, all colors will show up great! *The chalking can be pretty drying to your hair, so make sure you condition your hair really well after you wash this out! *This looks really cool when you braid hair, the different colored strands will look beautiful braided! I still cannot believe how how well this colored my hair! It is so fun! Wait til you try it! Post below the pictures of your "hair chalking" or tweet them to me, I'd love to see!!! ~and as always feel free to share this on facebook and twitter with all your "color lovin'" friends! I would love to do this but I have one question ...When the chalk is dried in your hair is it hard like its been hair sprayed or does your hair feel natural ? What's the best? Washing your hair roght before you put in the chalk or wash your hair and just do it the next day? Who knew? 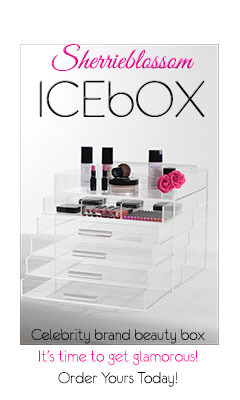 This is perfect for me since I don't think a big blue streak in my hair would go over well at work. Hello weekend! This looks so fun! Can't wait to try it! Can I do this with my kids sidewalk chalk? What brand of pastel chalk did you use/ where did you purchase yours? FYI these are not like 5 bucks at michael's... To get anything with more than 10 blah colors in it was like $50 or more... Just sayin cuz I was pretty bummed! I tried this on my dark brown hair, and it didn't turn out as good as yours! The chalk on my hair turned to dust after it dried! How did you get yours so vibrant and get it to stay? From where did you get these chalks ? Are they the same one which is used for painting ? No I have bought these at michaels for 5.99. Same exact set. Ive tried this a couple times with the same pastels that you used and once it dried it is very ratty and tangled. :( I've tried to use smaller pieces and it still turns it into a rats nest. Help?! Am I doing something wrong? I would love to try this but I don't dye my hair at all because i love my natural hair color and some of my friends have dyed their hair but cant get their natural hair color back even though they have let it grow out. I would love to add some color to my hair and change it up. If i put the chalk in my hair would it dye my hair or change my natural hair color after i have washed the chalk out? My hair is dark. Loved it! thank you for showing all of you're fans how to do this. By the way you're purely Beautiful!. How long does jt last? After I do my hair chalkin after I dry it it doesn't look as bright and I have truoble sealing the color and styling. What colors show up best in light or dark hair? I used chalk on my dog. It takes weeks for the color to come out. Maybe because when we use it on the wet hair, I use the blow dryer and it sets the color to make it more permanent? Or is it beause I use sidewalk chalk?......Hmmmmm...... Great idea though. With the chalk in your hair it grts dry and knotty. I couldnt really brush through my hair with the chalk in it. I havent washed it out yet. I will admit it is fun and pretty! Colour comes off all over my clothes. How do you keep it from turning to dust and practically blowing away?? Seems like that doesn't happen often though, don't want to discourage anyone! Me and my sister tried this. It turned out really cute but was a bit of a mess lol. And I got my pastels at michaels for 4.99 and then they give you a 40 percent coupon so I paid $3.14. Btw can you buy the chalks in holland to? Its not the same as dying your hair because it is a washout thing that has no poroxides in it. therefore it just sits ontop of the hair strand vs. a permanent color goes into the strand.